Cloisonne Rock Fish Vase...East meets West in these distinctive Turquoise & Copper Rock Fish vases, a unique home accent. The rock fish vase is not watertight...use simple dried wispy branches for an added touch of elegance. An accomplished artist & designer, Fabienne Jouvin has had a passion for mixing cultural designs ever since she roamed the world from China to Cuba. Fabienne traveled to the villages where the ceramics are spun & hand painted, & worked directly with the crafts people to create unique designs. By immersing herself in the Asian culture, she was able to fully utilize the talents & abilities of the local crafts people. The result is a fabulous collection of ceramics with themes & colors that are soft, pleasant, & easy to live with. Fabienne's designs offer a perfect balance of French style & Asian art that is modern yet timeless. 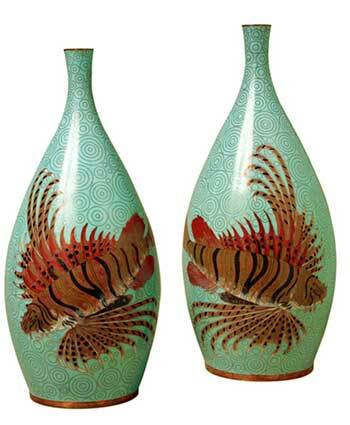 Turquoise Rock Fish Cloisonne Vase. Size: 9 1/2" x 20" H.
Bronze, gold foil, & Porcelain.